Simon Sinek wrote a book, Start with Why that is a smash hit for the very reason that Sir Robert Baden-Powell provided this quote. A team will work harder and more enthusiastically when they know the reasons why a particular action are required and what part they have in the overall reason WHY. One other item to consider, although I've found it to be less of an issue than during my time in the military, is that there may be times when you aren't able to share the why and your team still needs to execute. If you are trusted, shown solid comprehension and understanding, and worked largely with the team's best interest in mind, then the team will probably execute without knowing the "aim." But that rarely comes first. So, are you building the relationship with your team? Do they trust you? Do they know the "why" of what you ask them? If you are, great keep it up! If you are not... then I think there is some work to be done. Robert Baden-Powell was a Lieutenant-General in the British Army, author of Scouting for Boys, founder of the Scouting Movement, and first Chief Scout of The Boy Scout Association. 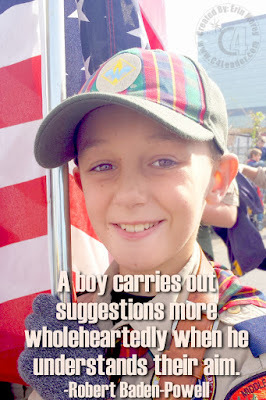 In a manner of speaking, he is responsible for the growth and development of thousands of boys into men through the scouting program (including myself). I wonder if he ever knew the influence his movement had over so many men in the last 100 years?